My birthday is coming up (June 10!) and this year it falls on a Saturday, so I'm trying to think of a big fun outing I can do with a bunch of friends! I've been doing a lot of research on different tours that we could do, and one that kept popping up was Riverside Food Tours. It has awesome ratings, and people rave about it on all the sites after they do it! There were a few things that stuck out as making them different from the rest. So, since I already did the research for myself I decided to share on the blog in case someone else out there is looking and I can save them some time! I'll be sure to update after we take a tour, but for now, here's the list of 12 things that sealed the deal on Riverside Food Tours as being the best one to go with! 1. They indulge their guests in a VIP experience because their groups are small. No more than 12 max. 3. Their food tours are not grab and go. Guests enjoy all the various dishes while sitting down and being served! 4. The cost of the food, tax and a 20% gratuity is included in the ticket cost. 6. They give you the privilege of meeting a few owners and chefs at various restaurants. 7. You enjoy their signature dishes and drinks that convey the identity of the establishment. No one never leaves hungry - their promise! 8. They create unique experiences that allow people to connect through local food in historic neighborhoods. 10. Their food tours are so much more than just eating. They include sightseeing and history as they immerse their guests into the local culture. 11. Their food tours are great for family and friend outings, special occasions or for entertaining out of town guests. They do all the work and you enjoy all the fun! 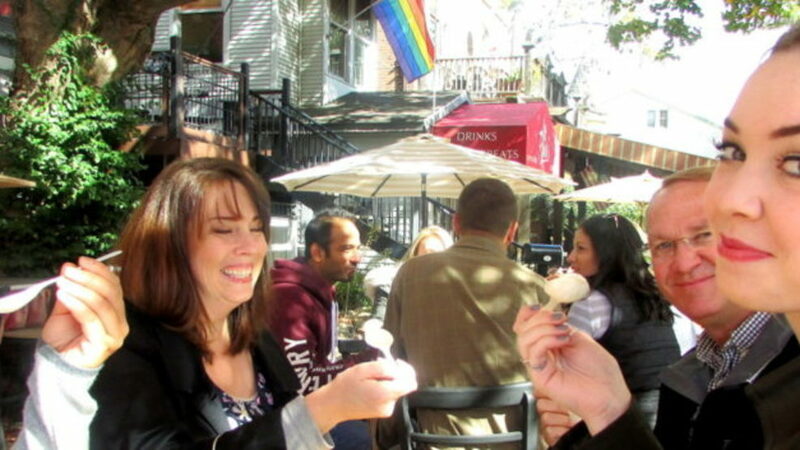 MAINSTRASSE FOOD TOUR - Enjoy generous tastings plus drinks from five unique privately owned restaurants.Step back in time as we explore the architecture and culture of this charming 1800's German Village. Receive a Food Tasting Guide with exclusive coupons for Riverside Food Tour participants. MADISON AVENUE FOOD TOUR - we visit five authentic family owned eateries where we taste delicious and fresh food representative from countries around the world. We enjoy a variety of food such as Shakshuka from Israel, a Persian sampler plate, an authentic Mexican taco, Chinese traditional dishes, plus local craft beer, coffee and pastries. The food tastings are enough for a satisfying lunch and are all included in the ticket price. ROEBLING POINT FOOD TOUR - Savor specially selected tastings from four unique, privately owned restaurants. Enjoy the stunning views of the Ohio River as we step back in time and explore the architecture and culture of the Licking Riverside neighborhood. Receive a Food Tasting Guide with exclusive coupons for Riverside Food Tour participants. CINCINNATI STREETCAR FOOD TOUR - Savor specially selected food servings and one alcohol tasting from five unique restaurants. Immerse yourself into city life as you are educated and entertained by your personal tour guide. By the end of the tour, you will be the expert on all downtown Cincinnati has to offer! Receive a Food Tasting Guide with streetcar map and your all day pass to extend your culinary adventure into the rest of the day!